Dice Devils GC: First Platoon!! On me!! With Historicon right around the corner, it's time to put the paintbrush and basing into overdrive. 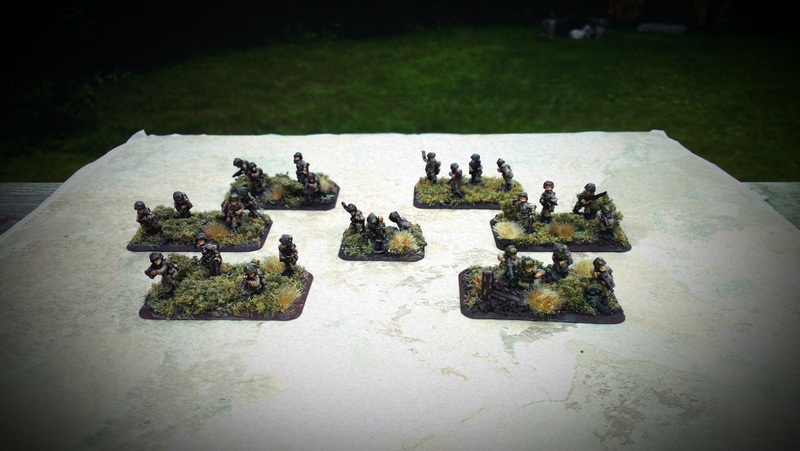 I've recently completed what will be one of two platoons of 82nd Airborne troops for this years tournament. I seldom reveal what I will be playing at any event, but seeing as it's my first National event....my expectations are less than high. I've been busy working on one platoon at a time and one stand at a time. I find it a little easier to keep track of what I have left to paint and once they're complete, I can move on to tanks. The hardest part, has been the color schemes, I went with a few different ideas to really make these guys pop. The scrim on their helmets is a very bright, almost neon green, but once it has been washed, it certainly subdues the color and it leaves a nice eye catching effect that is not distracting. Red Leather for their pistol holsters, airborne knives(M3) and gun slings. I used a Flat Brown for the boots and stocks of all the weapons, this included the BAR, M1 and Thompson MG's. Adding Gun Metal Grey to the barrels of the weapons, makes them stand out a little more. Though I find extreme detail a work a bit beyond my skill level so far when it comes to painting 15mm figures. In a past post, I mentioned before I was using a wash made by Warpainters. They come in several different shades and each one leaves it's own look on what ever it is you are painting. The darker ones are better for the armor/vehicles and some even have more of a gloss finish once they are dry. Basing these has been relatively fun to do and I have used a few things to get them just right. The initial basing is a fine coarse train ballast, followed up by a layer of dark brown paint. Spreading white glue liberally on the base, then place the entire base into some Burnt Grass from Games Workshop. The remaining tufts of grass are more train modelling flock and a whole bag of that will go a long way for $4! With a few more stands to do, including command and bazookas, I will be taking my time. Even though we have moved into July, there are still a few weeks left to get some more done and I will be on leave starting next week, so there will be even more time to get that armor up and ready to support the 82nd Airborne! The original plan for me, was to get some Canadians together for Historicon, but after doing 15 Chaffee tanks for my US Light Tank Company, I really feel like I have enough armor running around and wanted to do something different. There really is nothing like getting a new army on the table for a tournament. Once the whole army is done, I'll be sure to break out the game mat and set up some scenery to show the whole thing off. In case you are not a visitor to WWPD.net and it's vast network of sites, blogs and forum. This weekend, Operation Overlord kicks off it's 6 week campaign for Flames of War. Get over to the website and sign up if you have not already done so. Something else I am excited to announce, is the creation of the WWPD Challenge Coin, aka:'Project Ultra' until I had everything necessary from Steve of WWPD, including giving me the 'ok' and letting me run with this idea. The coin will look like the picture you see below and will measure 1.75" in diameter. The cost is $20 USD and can be found on the WWPD site for payment/delivery information. Some of the proceeds from the sale of the coins will be going to Wounded Warrior and there will only be 50 coins produced. Over half the coins have already been sold in the first week, so if you are interested please leave a comment or email me. They will also be available at Historicon for sale if you happen to be down there as well. I'm hoping to have them in hand for the tournament, the company minting these coins has given me an indication they will be done and in my mailbox well before that date. Love them! The bases are quite stunning!